An 18″ deep Scoop door canopy shown in the black painted finish. The 18″ circular steel planters are shown in the aged galvanized finish. Canopy heights of 7.5″ and 12.5″ also available to order. 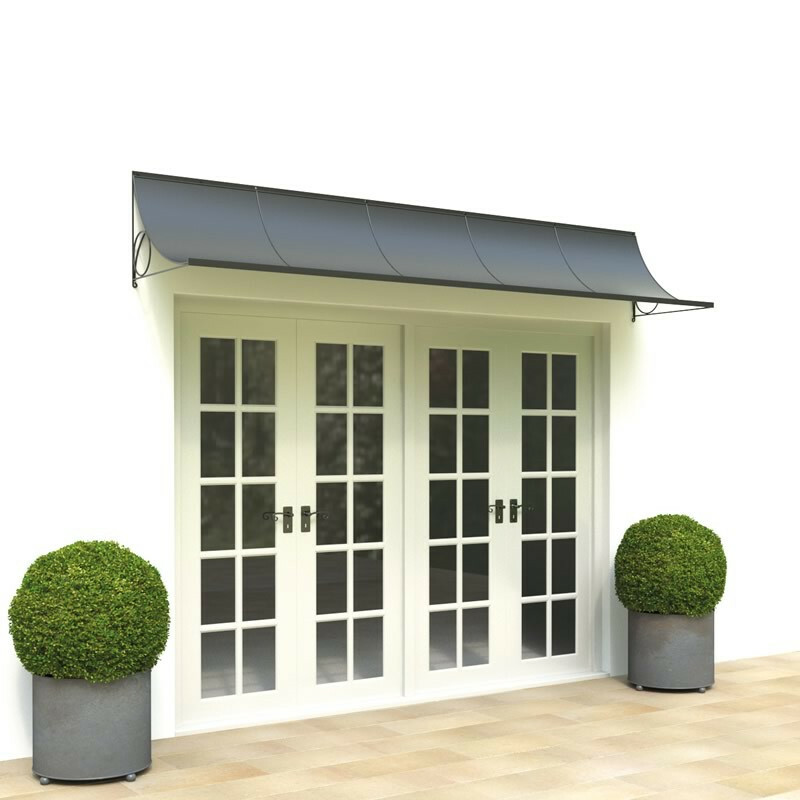 Our solid steel Scoop door canopy is hot dip zinc galvanized before painting matt Black or Grey, or can be Aged to achieve a mellow zinc patina that looks like a lead roof. We can reduce the 19” high roof to 12.5” if there is limited height above your door. The roof has a front lip to guide rainwater sideways. The canopy looks super over our bifold doors, we are delighted with the result. Thank you for the excellent service. Width – To ensure that you select the most appropriate canopy size, please measure the width of the doorway from wall to wall. 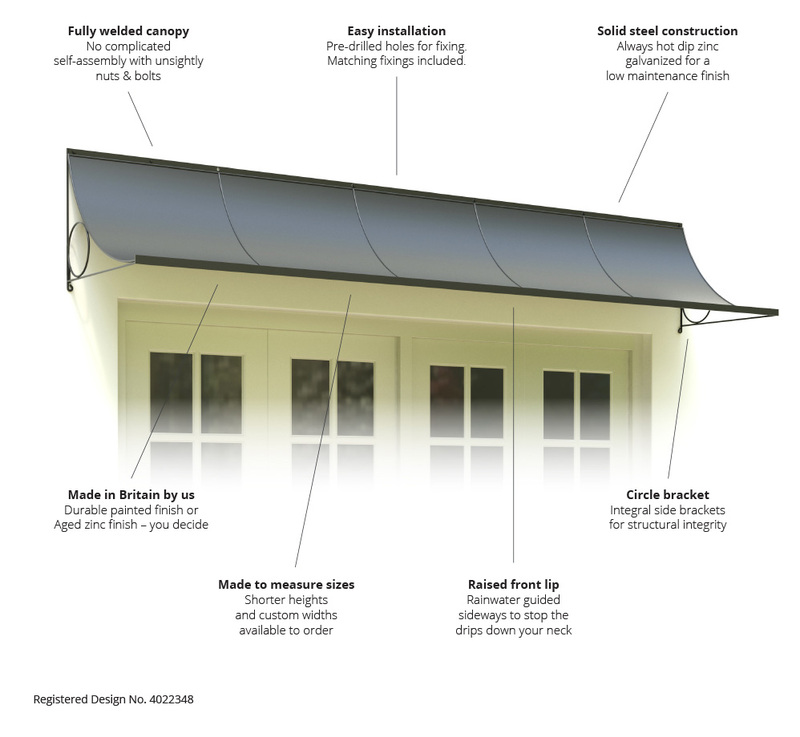 We recommend a minimum canopy overhang of 3”/75mm at both ends. Height – The standard canopy height is 19”, but we can make shorter heights of 12.5” or 7.5” to order. Measure the wall space available above the door. For more detailed advice, please get in touch. Each standard door canopy is a fully welded structure requiring no on-site assembly. The top rail has several pre-drilled holes, and both bottom corners have beautifully rolled eyelets for receiving the hexagonal head coachscrews (supplied). Ensure that the holes are drilled deeply enough to receive the screws. Once fitted, to be sure of a watertight fit, run a bead of good quality, clear roofing sealant along the top edge or use other roofing tape or lead flashing if your wall is very uneven. We can arrange delivery throughout the United Kingdom. We use an independent courier that offer next day delivery. Larger canopies are from £49.50, the price will depend on the number of items and weight of your order; we’re happy to provide a quotation prior to placing your order. Once ready, we will contact you to arrange a convenient date for delivery.